This is short and didn't provide much room for character development but plenty of background was presented to give us a good feel for them. I liked all three main characters. 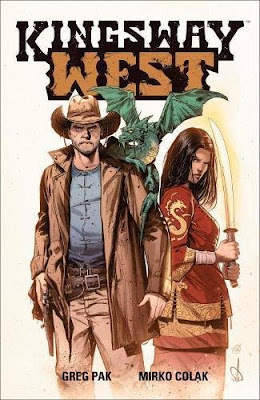 This western fantasy gives us an interesting world where the present United States is divided into ethnic areas. In the north, there is the United Staes of New York, in the Oklahoma region are the blacks, there is an Indian nation, the Mexicans, and finally the Golden Mountain Empire of he Chinese. The world is inhabited by monsters and flying dinosaurs. There is a gold rush going on involving magical red gold. Our main character, Kingsway La, is a Chinese gunslinger living in the wild with his Mexican wife. Ater his wife disappears he reluctantly joins people from other nations on his quest to find his wife. The book ends on a finite note but leaves us with the knowledge that life and adventures will carry on from here, hinting at a sequel. The art didn' impress me too much but I was ok with it, making this, in the end, a quick, entertaining read.